In this week’s Torah portion we read the following from Vayikra / Leviticus 20:1-7, וידבר יהוה אל־משה לאמר 20:1 And the LORD spoke to Moses: ואל־בני ישראל תאמר איש איש מבני ישראל ומן־הגר הגר בישראל אשר יתן מזרעו למלך מות יומת עם הארץ ירגמהו באבן 20:2 Say further to the Israelite people: Anyone among the Israelites, or among the strangers residing in Israel, who gives any of his offspring to Molech, shall be put to death; the people of the land shall pelt him with stones. ואני אתן את־פני באיש ההוא והכרתי אתו מקרב עמו כי מזרעו נתן למלך למען טמא את־מקדשי ולחלל את־שם קדשי 20:3 And I will set My face against that man and will cut him off from among his people, because he gave of his offspring to Molech and so defiled My sanctuary and profaned My holy name. ואם העלם יעלימו עם הארץ את־עיניהם מן־האיש ההוא בתתו מזרעו למלך לבלתי המית אתו 20:4 And if the people of the land should shut their eyes to that man when he gives of his offspring to Molech, and should not put him to death, ושמתי אני את־פני באיש ההוא ובמשפחתו והכרתי אתו ואת כל־הזנים אחריו לזנות אחרי המלך מקרב עמם 20:5 I Myself will set My face against that man and his kin, and will cut off from among their people both him and all who follow him in going astray after Molech. והנפש אשר תפנה אל־האבת ואל־הידענים לזנות אחריהם ונתתי את־פני בנפש ההוא והכרתי אתו מקרב עמו 20:6 And if any person turns to ghosts and familiar spirits and goes astray after them, I will set My face against that person and cut him off from among his people. והתקדשתם והייתם קדשים כי אני יהוה אלהיכם 20:7 You shall sanctify yourselves and be holy, for I the LORD am your God. 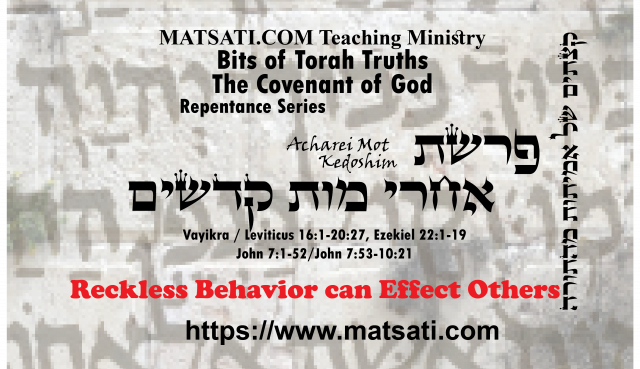 The commandments here are in relation to the fire-god Molech where the Lord God explains to us the spiritual connection and state of the one who joins himself to ungodliness in Vayikra / Leviticus 20:6. The description states the people would give their children to the fire-god to be burned upon the hands of Molech, an awful and wretched form of worship. If none of the people take care of this problem, the Lord says “I will set My face against that man and cut him off from among his people who profaned My holy name.” (ג וַאֲנִי אֶתֵּן אֶת-פָּנַי בָּאִישׁ הַהוּא וְהִכְרַתִּי אֹתוֹ מִקֶּרֶב עַמּוֹ כִּי מִזַּרְעוֹ נָתַן לַמֹּלֶךְ לְמַעַן טַמֵּא אֶת-מִקְדָּשִׁי וּלְחַלֵּל אֶת-שֵׁם קָדְשִׁי:) Notice how this is repeated two more times in verses 20:5 and 20:6. The Lord Himself will cut off such people who serve this evil god. Rabbeinu Bahya, Vayikra / Leviticus 20:2 Parts 1-2 states that this statement may also “refer to such situations as the deed being committed in secret when no witnesses were present at all, or a situation where the deed had been witnessed but the people do not care and do not testify against such a person. This may be due to their fear of revenge by family members of the guilty person or to other considerations. G’d means that He will not only intervene against the actively guilty party who “murdered” his children under the guise of a religious ceremony, but also against the silent onlookers who agreed with this cult.” To demonstrate the extreme concern of the Torah with this cult the Lord also stated the words לְמַעַן טַמֵּא אֶת-מִקְדָּשִׁי וּלְחַלֵּל אֶת-שֵׁם קָדְשִׁי, “in order to defile My Sanctuary and to desecrate My holy Name” (20:3). The Torah tells us that he who has fellowship with these things hoping to sacrifice only one of his children will have all his children destroyed by God as a result. Sforno on Vayikra / Leviticus 20:2 Part 1 states, “אשר יתן מזרעו למולך, after the Torah had explained G’d’s plan to sanctify the Israelites in order for them to become as much like Him as is possible for any creature, and He taught them the path to take to achieve such an aim, it now warns of a lifestyle which could produce the opposite result.” Note how Sforno states this warns of a particular lifestyle that we are to be careful not to have a part in. If we consider the greater context, in addition to next week’s Torah portion, Parashat Emor, we read of spiritual contamination as it is related to ritual purity that comes by coming in contact with the dead. This Torah portion also speaks of physical blemishes and going before the Lord, both for the priest and the common man which would disqualify one from carrying out his duties before God. (i.e. the priests in the Tabernacle.) The commandments of God also relate to the impediment of ritual contamination which represents the sacred things, the sacrifices, atonement, forgiveness (the spiritual things). Notice how spiritual contamination is related to all of these things. In addition, we are given commands related to the abuse of the sacred objects in the Tabernacle, which is juxtaposed to incestuous marriages. This is related to the contamination of one’s seed, i.e. where a person has been born by incestuous sexual relations with forbidden partners. All of these things are connected to this week’s double portion with the desecrating of one’s seed (children) by sacrificing to the abomination, the fire-god Molech. This is the context under which the Torah writes the words למען טמא את מקדשי ולחלל את שם קדשי, “in order to defile My Sanctuary and to desecrate My holy Name” (20:3). Our lives, what we think and what we do, are connected to the sanctuary, the holy place of God. Taking these things into consideration, what might be a modern day Molech? Consider in the statement of the Lord saying “I will set My face against that man and cut him off from among his people who profaned My holy name.” (ג וַאֲנִי אֶתֵּן אֶת-פָּנַי בָּאִישׁ הַהוּא וְהִכְרַתִּי אֹתוֹ מִקֶּרֶב עַמּוֹ כִּי מִזַּרְעוֹ נָתַן לַמֹּלֶךְ לְמַעַן טַמֵּא אֶת-מִקְדָּשִׁי וּלְחַלֵּל אֶת-שֵׁם קָדְשִׁי:) We understand this may also refer to the sin-laden human condition which is destined for death and decay. This speaks of the hidden sins, those which no man sees. This raises the bar to our accountability before God. The Lord says we are to sanctify ourselves because He is our God. This sanctification process includes life and not death. Just as we read last week, each time Yeshua the Messiah healed a leper, it illustrated the reversal of the corrupt mortality that we live in. Every leper healed of his affliction was a testimony that the kingdom of heaven was at hand. This is why Paul wrote “Who will set me free from the body of this death? Thanks be to God through Yeshua the Messiah our Master!” (Romans 7:24-25) The Messiah came to set us free from the ways of death and to empower us by the Spirit of God to overcome sin “if” we believe in Him and seek Him all the days or our lives!